Spread across 15,000 sq ft, Koskii Tower gives you a feel of grandeur with its new wardrobe approach. This is the first large format store of the brand, built at the cost of INR 2800 per sq ft. The store gives an enthralling dekko of ethnic wear, showcasing age-old textile techniques like phulkari, kundan, zardozi, aari, nakshi and chikan work. Koskii, the bespoke bridal and occasion wear brand in Bangalore, created a new identity with a swanky flagship store, Koskii Tower on Kamaraj road, Bangalore. Spanning across 15,000 sq ft, the tower is an abode for lehengas, sarees, gowns, salwar suits. 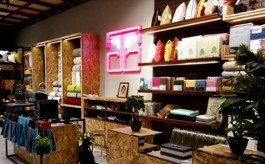 The flagship store is designed by Bangalorebased design agency Restore. 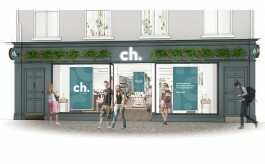 The new retail identity of the brand helps familiarise its legacy while connecting with newage consumers. The store looks expansive and aspirational, exuding a luxurious feel despite accessible pricing of its products. Koskii, meaning a girl in the Nawayati language, traces its roots to the early 1900’s when the silk and cotton textile business was established by Abdul Rehman Badsha and his four sons in Virajpet, Kodagu. The first retail outlet, CH Badsha and Co was set up in 1914 at Mercara. A strong sourcing network at traditional textile, weaving and karigari centres was also built across India to ensure high quality and design exclusivity. The brand continues to rely on the legacy of sourcing connections even today. The Mina Bazaar occasion wear brand was established alongside by Abdul Rehman’s grandson-in-law Saifulla Akhtar in Kolar in 1992. 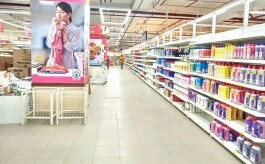 It opened its door to Bengaluru in 2009 with its first store in Shivajinagar. The brand later expanded to stores at Kamaraj Road, Chickpete, Commercial Street, Jayanagar, Phoenix Mall & Mantri Square in Bangalore. The over 100-year old heritage textile brand broke away from its traditional one-store concept and took a plunge into building a chain of stores in Bangalore in 2009. In 2016, Mina Bazaar rebranded itself as Koskii with a vision to create a national brand. “We hired BrandVak, a branding agency, in early 2016 to help us with our vision to create a national brand. We were catering to middle and upper middle class and our primary target customer was the young bride-to-be. We learned that the word “Bazaar” in our brand name did not appeal to this segment and it also denoted a name that catered to the masses. We were advised by our agency to drop the word “Bazaar” from our brand name. That is when “Koskii” was born. It was hard to let go of a brand name that we carried for 25 years but we had to create a fresh platform to capture new customers and new markets,” Koskii CEO Umar Akhter said. The brand currently has 8 stores in Bangalore and is set to expand its retail presence into Chennai, Hyderabad markets. The brand initially relegated its rollout to Bangalore to strengthen its strong foothold in the city. With increasing demand from other parts of South India, it is now planning to move in different directions. Eventually, the brand envisions a pan India presence. In order to make the space more inviting, the store has taken the wardrobe approach to make the products more accessible. The simple design of the store façade makes the store signage stand out. The warm and royal design ID is influenced by Jaipur’s architecture. The aura of the logo and branding is further used as lighting fixture on the ceiling to light up the entrance of the store. The store uses a natural tone and texture and stone tiling. The new outlet is spread over three levels and takes a design of haveli. The ground floor has Lehenga and Gown section. The spiral staircase is in satin white finish paired with marble treads. The store front has mannequins suspended from the ceilings and also has a unique concept of mannequins seated on swings, displaying their exclusive collections. The first floor has a mezzanine section, which is meant for showcasing exquisite bridal collections and has a muted oak textured flooring, which adds warmth to the space. The mezzanine section has mannequins suspended from the ceilings as well. The mannequins displays their exquisite collections of lehenga and gowns. The second floor is dedicated to sarees. The store resonates ‘live the occasion’ spirit. It is designed to not only cater to the wedding day wear but also other occasions such as Mehendi, Haldi, Sangeet and Reception. The store has a dedicated Karigari studio for young brides-to-be to come in and free their imaginations and give shape to their creativity with customised designs. As a business, the brand targets a sales density of INR 2000 per sq ft carpet for Koskii’s larger format stores. “Our opening month has taken us very close to this target. We are confident that we will sustain, grow and consolidate our position with passage of time by spreading more awareness about the store.” Umar said. The brand aims to hit over INR 35 crore by the end of the financial year. Fixtures: Elemental Fixtures Pvt. Ltd.
Signage: City sign & Co. Tags : Restore Designs Elemental Fixtures Pvr. Ltd. Tranz Mannequins Gardler Lighting Light Zone.